Embroidered apparel made easy. Create unique and personalized projects by adding machine embroidery designs. Uptown Embroidery sells only the highest quality embroidery designs with your satisfaction in mind. with the perfect embroidery design. 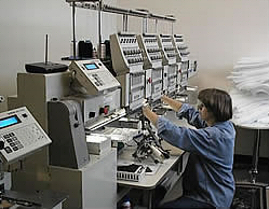 Uptown Embroidery is an experienced embroidery manufacturer that provides full service embroidery needs. We have large production capacity advanced by state of the art embroidery technology and professional workers. Embroidery is located in beautiful downtown Salt Lake City, host city of the 2002 Winter Olympics. servicing many local companies for all their embroidery needs. Create unique and personalized projects by adding machine embroidery designs. Embellish garments, home decor, gifts, holiday projects, and crafts with the perfect embroidery design.. If you are looking for personalization, logo wear, and looking to get exactly what you want with us…….